The Spatial Specificity Paradox in brain imaging, remedied with valid, infinitely-circular, inference - Jonathan D. Rosenblatt - Stats, R, and possibly beach volley. The most prevalent mode of inference in brain imaging is inference on supra-threshold clusters, with random field theory providing error guarantees. This introduces a spatial specificity paradox. The larger the detected cluster, the less we know on the exact location of the activation. This is because the null hypothesis tested is “no activation in the whole cluster” so the alternative is “at least on voxel is active in the cluster”. This observation is now new, but merely an implication of the random field assumption. To deal with this paradox, we propose to estimate the amount of active voxels in the cluster. If this proportion is large, then there is no real paradox. If this proportion is small, we may want to “drill down” to sub-clusters. This introduces a circularity problem, a.k.a. selective inference: we are not making inference on arbitrary voxels, but rather, voxels that belong to statistically significant clusters. In the spirit of the FDR, we call the proportion of active voxels in a cluster the True Discovery Proportion (TDP). 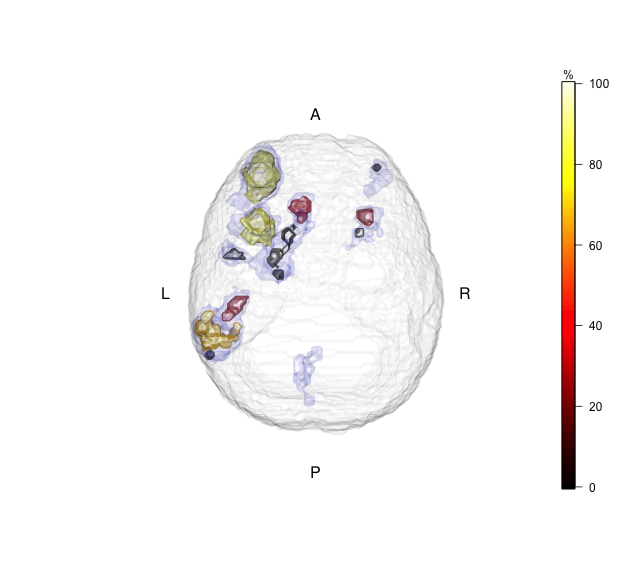 We use recent results from the multiple testing literature, namely the All Resolution Inference (ARI) framework of Goeman and other [1,2], to estimate the TDP in selected clusters. It takes voxel-wise p-values and returns TDP lower bounds. The algorithm is very fast, as implemented in the hommel R package. For brain imaging, we wrote a wrapper package, ARIbrain. The TDP bounds using ARI come with statistical error guarantees. Namely, with probability (over repeated experiments), no cluster will have an over estimated TDP. The above guarantee applies no matter how clusters have been selected. The last item has quite surprising implications. It means that ARI provides statistical guarantees if selecting clusters and estimating TDP from the same data, and particularly if clusters are selected using random-field-theory significance tests. It also means that one may create sub-clusters within significant clusters, and estimate TDP again, without losing error guarantees(!). It also means that one may select clusters using the TDP itself, and if unsatisfied with results, re-select clusters using which ever criterion, ad infinitude. Here is an example of PTD bounds in sub-clusters, within the originally selected clusters: . How does this re-selection not invalidate error guarantees? Put differently, how does ARI deal with this infinite circularity? The fundamental idea is similar to Scheffe’s method in post-hoc inference. The idea is to provide statistical guarantees on TDP to all possible cluster selections. This means that any cluster a practitioner may create, has already been accounted for by the ARI algorithm. Providing valid lower TDP bounds is clearly not the only task at hand. Indeed, bounding all TDP’s at satisfied the desired error guarantees, for all possible cluster selection. The real matter is power: are the TDP bounds provided by ARI tight, given the massive number of implied clusters being considered? The answer is that the TDP bounds are indeed tight, at least in large clusters where the spatial specificity paradox is indeed a concern. Two fundamental ingredients allow ARI to provide informative TDP bounds, even after this infinitely circular inference. The first ingredient, is that we do not consider all possible brain maps, but rather, we assume the the brain map is smooth enough. This smoothness is implied by assuming that the brain map satisfies the Simes Inequality, which excludes extremely oscillatory brain maps, which would require more conservative bounds. The Simes inequality is implied by the Positive Regression Dependence on Subsets condition, which is frequently used in brain imaging, since it is required for FDR control using the Benjamini-Hochberg algorithm. The second ingredient, is that the TDP bounds are provided by inverting a closed testing procedure, which is a powerful algorithm for multiple testing correction. The compounding of a closed testing procedure in a smooth-enough random field, implies that the true TDP cannot be too far from the observed TDP, so that it may be bound while being both informative, and statistically valid. The full details can be found in our recent contribution, now accepted to Neuroimage . Goeman, Jelle, et al. “Simultaneous Control of All False Discovery Proportions in Large-Scale Multiple Hypothesis Testing.” arXiv preprint arXiv:1611.06739 (2016). Goeman, Jelle J., and Aldo Solari. “Multiple testing for exploratory research.” Statistical Science 26.4 (2011): 584-597.